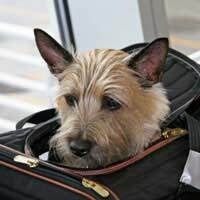 Home > Overseas Travel > Where Can We Take Our Pets? The introduction of the Pet Travel Scheme (Pet Passport) means that we are able to take our pets with us on holiday if we choose to do so. However, the choice of destination is constantly under review and can be changed at any time. Even in the UK there are limitations on destinations that are available to dogs especially at the height of summer time. Technically you pet can travel anywhere in the world but if you intend for it to return to the UK it is then that the pet passport terms have to be followed. Any animal not conforming will be put into quarantine for six months. At present UK resident dogs, cats and ferrets can travel to and from European countries (EU) that are in the scheme. Any pet living in a EU country can also enter the UK under the scheme. Austria, Azores, Balearic Islands, Belgium, Bulgaria, Canary Islands, Ceuta, Cyprus, Czech Republic, Denmark, Estonia, Faroe Islands, Finland, France, French, Germany, Gibraltar, Greece, Greenland, Guadeloupe, Hungary, Ireland, Italy, Latvia, Lithuania, Luxembourg, Madeira, Malta, Martinique, Netherlands, Poland, Portugal, Romania, Slovakia, Slovenia, Spain, Sweden. There is also a list of non-EU countries that are part of the scheme at present they include:Andorra , Fiji, New Caledonia, Antigua & Barbuda, French Polynesia, New Zealand, Argentina, Grenadines, Norway, Aruba, Guam, Russian Federation, Ascension Island, Hawaii, St Helena, Australia, Hong Kong, St Kitts & Nevis, Bahrain, Iceland, St Pierre & Miquelon, Barbados, Jamaica, St Vincent, Belarus, Japan, San Marino, Bermuda, Liechtenstein, Singapore, Bosnia-Herzegovina, Malaysia, Switzerland, British Virgin Islands, Mauritius, Taiwan, Canada, Mayotte, Trinidad and Tobago, Cayman Islands, Mexico, United Arab Emirates, Chile, Monaco, USA (mainland), Croatia, Montserrat, Vanuatu, Falkland Islands, Netherlands, Antilles, Vatican, Wallis & Futuna. Holidays with a pet in the UK is different in that you do not need a pet passport. However many holiday places now have restrictions on dogs visiting beaches during the summer months. This could somewhat limit and spoil the family holiday if you so not check this out before you book the holiday. If staying in a hotel, or self-catering establishment, then ask the owner or manager. If still in doubt contact the tourist office for that town, most of them have a website, if not they should be able to advise you by telephone. Remember that holidays taken out of season are very pleasant and probably more suited to families with pets. In the UK and overseas the bylaws of the place you are visiting can be different from those at home. Most laws relate to dog owners and can be very infuriating, as dogs no longer seem to be as welcome as they once were. By keeping your dog on lead in public places, picking up after them and ensuring they are not left alone to make a noise you are probably covering most of the rules. As advised above check the websites of the areas you are visiting in the UK and check their dog laws. For overseas visiting ask your tour operator or telephone the Embassy of your destination.